Last month, UH Hilo students and faculty members attended this yearʻs Hawaiʻi Sustainability in Higher Education Summit at UH West Oahu. They experienced the “Meeting of Wisdoms” panel, and connected with other Sustainability action-oriented students from different UH campuses. Alexis Stubbs won the the $10,000 Green Project Implementation Award for her “Waste Sustainability Initiative through Vermicomposting and Composting” project. Zoe Whitney won the S1,000 Green Student Leader Award and a Green Project Implementation Award for her “Choose to Reuse” project. Check out the full article posted at UH Hilo Stories! As Vulcans, let us continue to make the recycle, compost, reuse, and think about sustainability and our environment! Think you have an awesome project idea involving Sustainability in mind? Please keep yourself updated through this blog or the University of Hawaiʻi News for the application on next yearʻs Presidentʻs Green Initiatives Award. We would love for more sustainability Vulcan victories! To better understand student behaviors and actions toward recycling and composting, the UH Hilo Sustainability Committee is currently distributing the Spring 2017 Sustainability survey! The intent of the survey is to utilize collected information for improving sustainability practices and opportunities in the UH Hilo. Click on this image to take the survey! The data will be distributed each semester to track the student bodyʻs common understanding of on-campus recycling and composting. 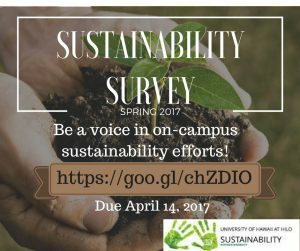 So, if you have responded to last semesterʻs survey, please respond to this Spring 2017 survey. 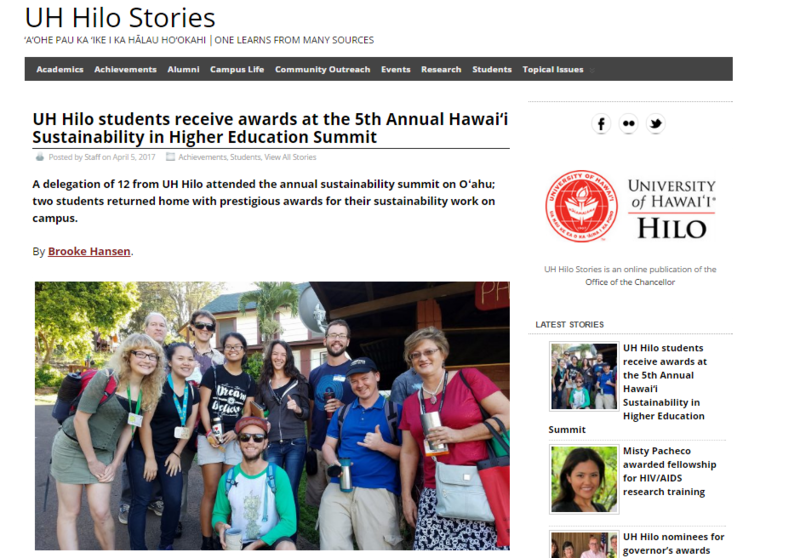 Sustainability efforts aim in reaching the universityʻs goals of being a zero-waste institution. With your honest feedback and helpful responses, we can achieve toward sustainable compus! Mahalo! Leaving a minimal foot print is ideal when it comes to sustainability practice. It is important to acknowledge this here in Hawaiʻi, as the most secluded landmass on earth. The world is demanding our attention through pronounced temperature changes and sea level rises around the world. We have seen more environmental disasters in recent years than ever before, bringing us closer to a threshold impact on the earthʻs systems. It is no longer a matter of if, but a matter of when. It is up to us as the leaders of future generations to change our wasteful habits.